McKee Property Management is one of College Area’s leading property management and leasing companies. Since 1982 we have helped thousands of College Area property owners with their management and leasing needs, and we continue to be an industry leader in the markets we serve. We invite you to learn more about us, and our innovative systems that help us rent your property faster. Signage – McKee Property Management has gained the reputation as an industry leader in the College Area rental market. With over 30 years in the industry, our signature green and blue FOR RENT signs have become a familiar sight around San Diego County. Home to one of the most desired colleges to attend, San Diego State University. 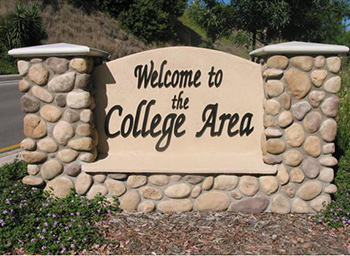 College area is also home to K-12 schools in the area, shopping, restaurants and parks. 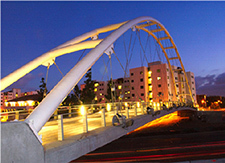 Redevelopment of SDSU and University controlled property, beginning in the 1990's, caused intensification of uses in the community near the campus, which is ongoing and includes the extension of the San Diego Trolley through the community with two stations: one on campus at SDSU and one opposite Alvarado Hospital on Alvarado Road.